It was cold and rainy/overcast when we arrived! Is it summer? 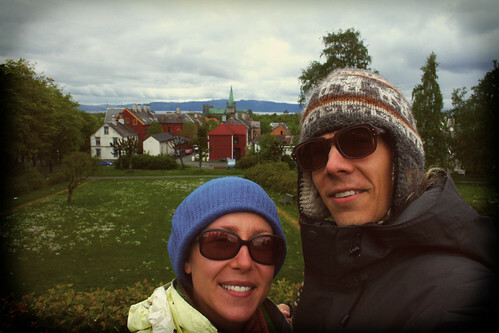 We arrived in Trondheim, Norway after almost 24 hours of traveling. Even though we are pretty jet lagged, we decided to try and walk around the city to see some of the sights. Here are the highlights from our short walk. View of the colorful riverside buildings from the red bridge. There is a huge tidally influenced river that flows through the center of Trondheim. 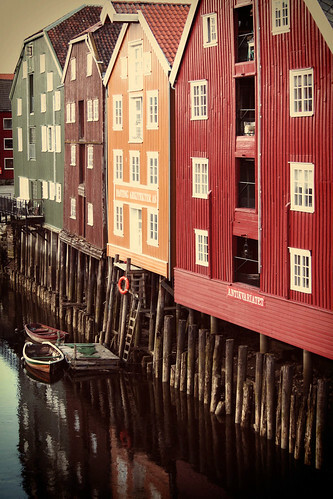 It comes from the mountains inland, and flows into the fjord, which is actually part of the North Atlantic ocean. The river is named the Nid and there are many bridges that cross over it. One of them in the old downtown area is nicknamed the Red Bridge (because it's red!) and from it you can see all of the colorful buildings that line the river. Their foundations are 'wet' and they actually stand partially on stilts! 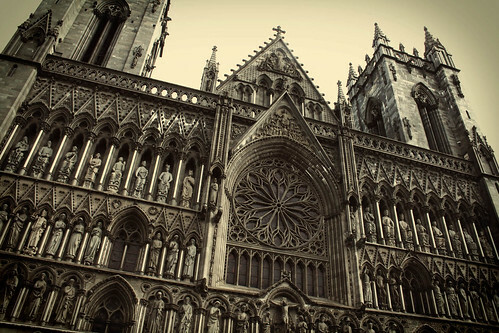 Nidarosdomen cathedral is the largest medieval age building in Scandinavia. Towards the old center of town stands the Nidarosdomen, or the Nidaros Cathedral. It used to be a pilgrimage place for many religious Norwegians, who came here by foot on a special trail. It is the largest medieval age building in all of Scandinavia, and is part of an ancient archbishop's palace complex. It used to be where all of the kings of Norway were crowned. 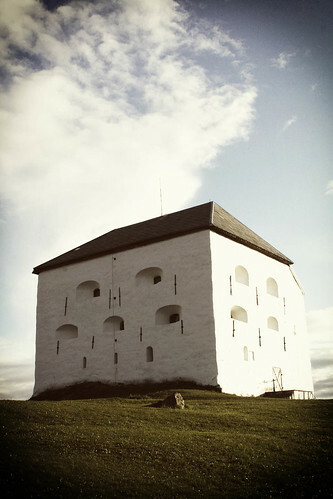 The white fort (Kristiansten) stands perched above Trondheim on the top of a hill. At the top of one of the hills surrounding the city is a white fort called Kristiansten. We walked up the hill through a really nice neighborhood and walked around. There are old canons and stuff surrounding the fort, and a nice lawn where people have picnics. You can see almost all of Trondheim from the fort. 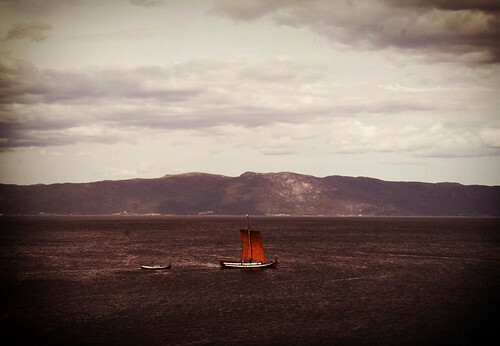 A traditional Norwegian ship sails in the fjord. We also saw a traditional Norwegian boat (maybe based off of the Viking design) sailing in the fjord. It was in town because it was taking part in an outdoor play that week.